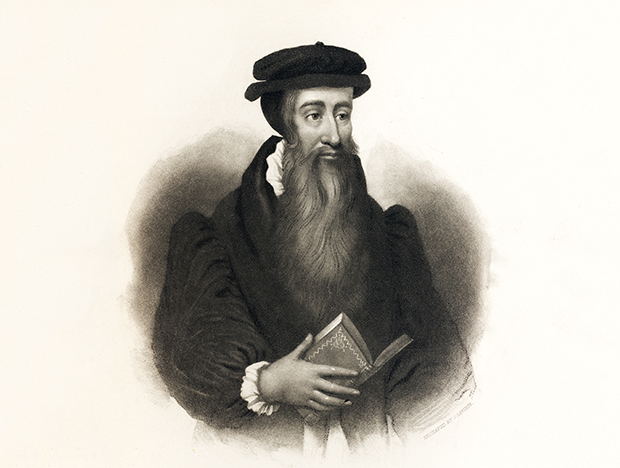 Note: In 2014 we're commemorating John Knox's 500th birthday for Reformation Sunday. Download our bulletin insert  about Knox's interview with Queen Mary, explored at length in this blog post. Before John Knox returned home from exile to become a hero of the Scottish Reformation, he penned a shocking polemic against women in roles of authority: The First Blast of the Trumpet against the Monstrous Regiment of Women . The diatribe, which he planned to follow with a second and third blast, set the stage for a tumultuous relationship with four ruling queens: Mary of Guise (1515-1560), Mary Tudor (1516-1558), Mary Stuart (1542-1587), and Elizabeth Tudor (1533-1603). Knox used “monstrous” and “regiment” in an archaic sense to mean “unnatural” and “rule,” arguing that female dominion over men was against God and nature. He lamented that the future of the Protestant faith lay solely in the hands of a female monarchy largely hostile to its precepts. 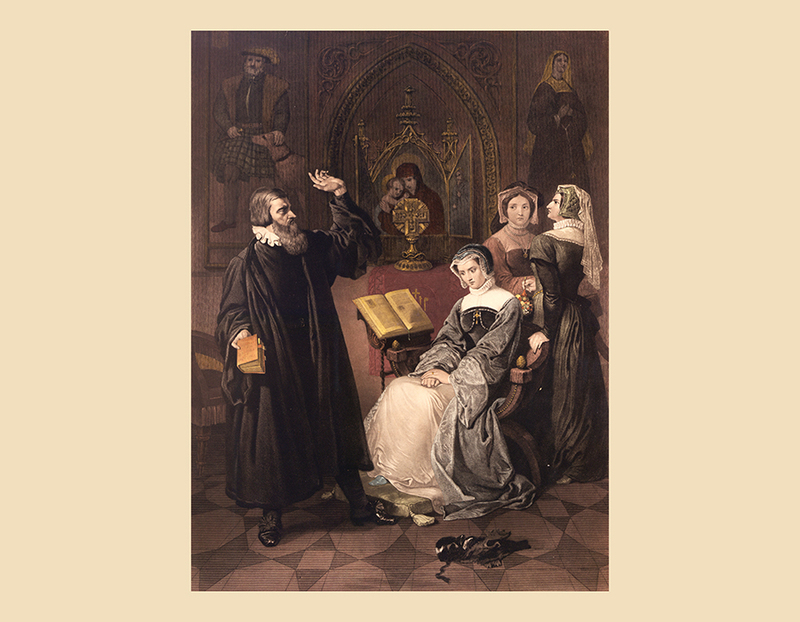 Echoing the era’s widespread assumption that women were inferior to men, capable only of domestic acts such as bearing children, Knox placed blame on the "abominable empire of wicked women" for the trials and tribulations of the Reformation. The events which led Knox to write The First Blast likely began in 1556, when he penned a letter to Mary of Guise, Queen Regent of Scotland, simultaneously praising her for saving him from facing charges of heresy in Edinburgh and criticizing her Catholic faith. Mary of Guise was not impressed. Calling his letter a “pasquil” (an abusive lampoon), she revived his heresy trial and Knox was publicly burned in effigy in Scotland. The following year, Knox attempted to return to Scotland but found his invitation home withdrawn by Queen Mary when he reached the French port of Dieppe. It was during this time, stranded in France, that Knox expressed his frustration by composing The First Blast. In 1558, after publication of The First Blast, Knox continued his pasquil by also publishing his original letter to Mary of Giuse as part of a trio of open letters to the Scots, further denouncing the female monarchy and appealing to his right to return and preach in his native land. Knox wrote in opposition to arguments made by John Calvin  and Heinrich Bullinger , who called upon Deborah and Huldah as examples of God’s willingness to suspend the natural order and raise women up to positions of authority. Knox refused to acknowledge a woman’s natural right to rule—even in cases when there was no male heir to the throne. Unlike Knox, Calvin thought it unlawful to interfere with long-standing practices of inheritance established by God. In 1558, Mary Tudor’s half-sister, the Protestant-leaning Elizabeth Tudor, succeeded to the throne of England. Though not the intended target of Knox’s First Blast, Queen Elizabeth took great offense at the publication, and in 1559, repeatedly refused Knox passage to Scotland through England. Knox attempted to apologize to the queen, writing a series of letters to her chief advisor, Sir William Cecil, but again managed as much criticism as praise. Like Mary of Guise before her, Elizabeth Tudor became more agitated with the reformer. In 1561, soon after Knox made it home to Scotland, the return of Mary Stuart, Queen of Scots, threatened to turn Scotland back to Catholicism. 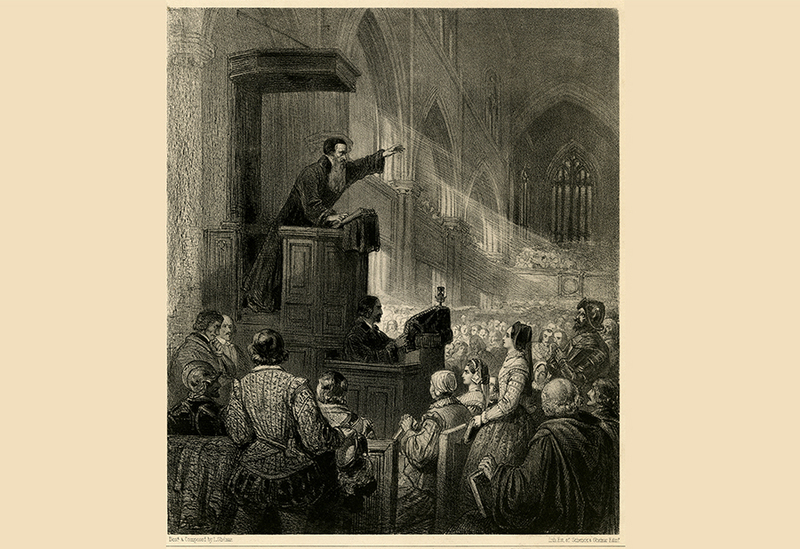 Hearing of his sermon at St. Giles against her first mass, Queen Mary summoned Knox to Holyrood Palace, where she charged him with promoting rebellion, sedition, and slaughter; publishing a book attacking her and her mother’s authority; and practicing necromancy—an accusation which alluded to the reformer's power over the people of Scotland and England. The Queen put forth an argument similar to Calvin’s, stating, “Ye have taught the people to receive another religion than that which their princes can allow, and how can that doctrine be of God, seeing that God commandeth subjects to obey their princes?” Knox’s response relied on a then-radical concept: the principle of limited and constitutional monarchy. Comparing the relationship of a subject and prince to that of a child and father, he contended that unlawful monarchs could be resisted by force. Their dispute culminated in a trial before the Privy Council where Queen Mary charged Knox with treason for supporting a protest against an illegal mass held in her absence. Despite her attempt at a final victory against Knox, the charge was dismissed, and the trial ended in embarrassment for Queen Mary. Having endured the controversy of The First Blast, Knox went on to play a key role in Scotland’s opposition to the Catholic monarchy, solidifying Scotland as a Protestant, and Presbyterian, nation for centuries to come. As for his second and third blasts, it would seem that the "Trumpet of the Scottish Reformation " learned an important lesson. Neither was ever sounded.